Oil pared gains after the American Petroleum Institute unexpectedly reported higher inventories of U.S. gasoline and diesel last week, even as crude supplies declined. The API estimated Tuesday that stockpiles of gasoline rose 1.4 million barrels last week and diesel expanded 2.05 million, according to people familiar with the data, which is only disclosed to members. That would be a third straight increase for gasoline at a time when supplies typically shrink because of summer demand. Analysts surveyed by Bloomberg before the government’s weekly tally on Wednesday estimated a decline of 1.3 million barrels. “Typically, the builds start in September,” James Williams, an economist at London, Arkansas-based energy researcher WTRG Economics, said by telephone. Yet, the gasoline increase is “not that unusual, particularly because refineries have been running pretty much full out,” but if the government confirms it, oil prices could face downward pressure. 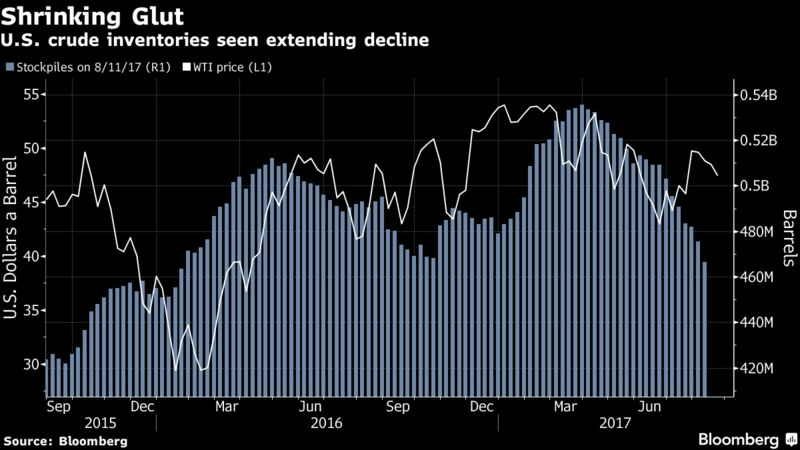 Oil in New York has floundered below $50 a barrel this month as the Organization of Petroleum Exporting Countries and its allies work to curb a worldwide surplus fed largely by American shale. Even as U.S. drillers withdraw rigs from fields, output from shale regions are forecast to reach a record next month. A committee set up to monitor OPEC-led cuts saw compliance with the agreement at 94 percent in July, down from 98 percent in June. West Texas Intermediate for October delivery traded at $47.64 a barrel at 4:40 p.m. after settling at $47.83 a barrel on the New York Mercantile Exchange. WTI for September delivery expired Tuesday at $47.64 a barrel. Brent for October settlement added 21 cents to settle at $51.87 a barrel on the London-based ICE Futures Europe exchange. The global benchmark crude traded at a premium of $4.04 to October WTI. A ministerial committee that reviews cuts by OPEC and its allies has a proposal to meet on Sept. 22 in Vienna, according to delegates familiar with the matter. Another panel, composed of technical experts, plans to meet to review compliance with the agreed cuts two days earlier, the delegates said. The market needs clarity on whether OPEC will extend its production-cut agreement further into 2018 before moving substantially higher, Bart Melek, head of global commodity strategy at TD Securities in Toronto, said by telephone. A pipeline linking Libya’s Sharara field to the Zawiya port has reopened Tuesday after an earlier shutdown. The Energy Department is accepting bids for 14 million barrels of sour crude oil from the U.S. oil reserve until Aug. 30, according to a notice of sale posted Tuesday. WTI will continue to trade at a discount to Brent but its relative weakness to the global benchmark will abate in the coming months, according to BNP Paribas SA.